The Narberth Studio consists primarily of our main floor studio space. Its warm and welcoming interior serves as a staple of the Narberth community, hosting kids from virtually all over the Main Line and beyond. 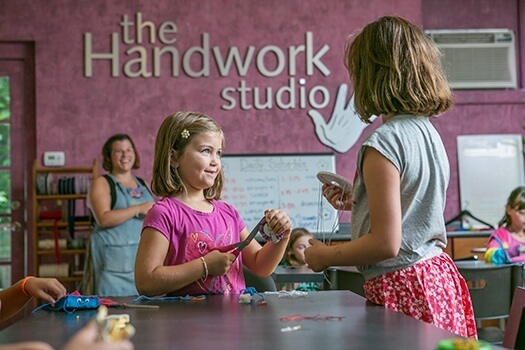 We offer a range of services at the Narberth Studio, including after-school classes from September to May, birthday parties, community events, Vacation Break Camps, as well as Handwork Camp from June to September. Our school year classes are held in our Narberth, PA Studio. They are a fabulous way to keep your child creatively engaged in project making with friends outside of Summer Camp. Classes meet weekly for 10 sessions in the Fall, Winter and Spring. We are pleased to offer badge workshops or projects to local area Girl Scout, Boy Scout and Brownie troops. 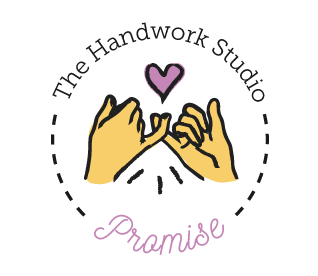 The Handwork Studio can comfortably hold up to 20 kids. If your troop is larger, just let us know when scheduling so we can make proper arrangements. Please call 610.660.9600 to schedule your event! These one-day camps are designed to keep kids entertained and engaged while they learn something new and fun. No previous experience necessary. Kids will leave with one or two completed projects. All supplies and materials included. Day camp is open to children ages 5-12 years old. Come and sample our programs with one of our kids' sewing and handwork workshops. Your child will take home one project at the end of each workshop and different seasonally themed projects are offered each time. All supplies and materials included. No previous experience necessary. All projects are gender neutral. Private lessons can be scheduled for adults or children. 1 Hour $50. We also have "Getting To Know Your Sewing Machine" Private Class. The cost is $25/30 minutes for a parent and child. Bring your own machine and we will show you how to use it. Call to schedule your appointment 610.660.9600. Customize your child’s birthday with a Handwork Party! Make stuffed animals, headbands, purses, toys or design your own project. Each party is 1.5 hours. Cost is $290 for up to 10 kids, each additional child is $30. Maximum of 20 children. Your birthday child is free if currently enrolled in classes. Add pre-ordered customized party favors and wow your child’s party guests for an additional fee! Appropriate for kids 5 and older. See party project ideas. We also offer Machine Sewing Birthday Parties! We can accommodate up to 8 children maximum. We offer this package for guests turning at least 9 years and older. Create your own camp with 5 or more campers! All camps offer a morning $65 (9:00am - 1:00pm), afternoon $45 (1:00 - 3:00pm) or full-day $95 (9:00am - 3:00pm) option. 11th Annual Student Art Show! On May 4th, 2018, check out all the amazing work our students have created this year! We are still accepting submissions until May 3rd. Art Show is being held at our Narberth Studio from 6:30-8:30pm. light refreshments will be served and our show is in conjunction with Narberth’s First Friday. Come on down for a great time! 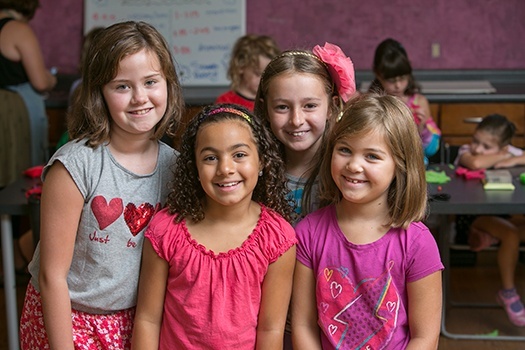 Each class session, we will invite your kids to bring a friend to class. This way your children can share the joy of their craft with the friends they love. Weeks of October 9 - 14, 2017, January 15-20, 2018 and March 5-10, 2018. Our 480 sq. ft. room is available for rent for meetings and private events. Save 10% on each child you register after your first!